Paula McLain captured the world’s attention with The Paris Wife, her novel about Ernest Hemingway and his first wife Hadley. She mined gold in her exceptional portrait of Beryl Markham in Circling the Sun. She’s returned to Hemingway and this time portrays his third wife, journalist and author Martha Gellhorn. Gellhorn met Hemingway in Key West then covered the Spanish Civil War alongside him in Spain in 1937 where they fell in love. They moved to Cuba where they restored a villa and created a writing life together. During this time Hemingway published For Whom the Bell Tolls and became as famous as his novels. While in Cuba, Martha worked on her own novel while yearning to return to her journalistic roots. Living in Hemingway’s shadow wasn’t an existence she could always reconcile with ease. Love and Ruin is a sensitive, yet exhilarating view of the couple’s life together. It shows how much they loved each other and wanted to make a complete life together. It also highlights how their passion for their writing and his depression and drinking led to periods of ruin that threatened and eventually led to the end of their marriage. While the novel focuses on Gellhorn and Hemingway’s life together, it’s most compelling when it illuminates Gellhorn’s remarkable achievements. The work she did highlighting the effects of the Great Depression on ordinary Americans, which led to her friendship with Eleanor Roosevelt when she was just twenty-five, helps the reader understand that Gellhorn was already a successful journalist and writer before she met Hemingway. Reading about Martha Gellhorn disguising herself as a stretcher-bearer and going ashore during the D-Day landing at Omaha Beach, where she was reported to be the only woman among the 150,000 men on that beach, offered a fascinating view of what women journalists faced in the 1940s. The glimpses of Gellhorn's career as a war correspondent and her interest in and compassion for the stories of the people she met were the most fascinating aspects of the novel. McLain captures Hemingway’s drinking, depression, brilliance, and pettiness so well that I sometimes found myself wanting to escape him for Gellhorn’s more exciting activities. Still, I appreciated McLain’s ability to tell both their stories and to reflect the truth of their lives and their relationship. Summing it Up: Read Love and Ruin to learn the remarkable story of journalist and war correspondent Martha Gellhorn. Enter the lives of Gellhorn and Ernest Hemingway as they fall passionately in love and watch them as they learn to live and love together. Gellhorn led a remarkable life and this novel illustrates it well. After you read the novel, visit McLain's website to view photographs of Gellhorn and Hemingway's time together. A personal note: I was particularly intrigued by Gellhorn’s work as a journalist and war correspondent for Collier's magazine in the 1930s and 40s. At the time, my great uncle was President and Publisher of Collier’s. In the spring of 1939 my mother, then seventeen, accompanied her aunt and uncle on a two-month trip to London and Paris to keep her aunt company while her uncle presided over almost daily meetings between the Duke of Windsor and author Sax Rohmer, who was interviewing the former king to write his story for Collier's. The following year as Martha Gellhorn wrote for Collier's, my mother started her freshman year at Sarah Lawrence College and frequently visited her aunt and uncle at their nearby home in Bronxville, N.Y. In my imagination, my mother might have met Gellhorn when she came through the city. My mother’s stories of her European trip and of her year at Sarah Lawrence, often visited me as I read Love and Ruin. Charlotte’s dad is in the hospital and her “best friend” is ignoring her. Ben’s parents are getting a divorce and he’s being bullied at school. Only a writer with Erin Entrada Kelly’s insights and talent could make middle school anguish feel real, humorous, poignant, and engaging. Kelly’s Hello Universe just won the Newbery Award. It’s outstanding and I loved it, but You Go First tops it. This is a book that will capture thinking preteens, especially those who don’t see their own lives as perfect. It’s also a book that teachers and parents will value because it will help them help the kids they love. Charlotte and Ben met via an online Scrabble game. She’s twelve, lives near Philadelphia and is lonely especially now that she’s afraid that her dad might die and there’s no one to talk to about it. Ben’s eleven and he lives in a small town in Louisiana. He's lonely and is being physically bullied at school. Just as he’s entering a new school where his interest in presidential history and Harry Potter isn’t appreciated, learning of his parents pending divorce leaves him confused and isolated. Both Ben and Charlotte are brilliant outsiders trying to survive middle school. They’re also kids who care deeply about words and the way they love learning and using words is both clever and endearing. Readers quickly become a part of Ben and Charlotte’s burgeoning friendship. With alternating chapters expressing each of their points of view, the reader quickly gets to know and care about them. You Go First celebrates friendship and the new ways kids form friendships online before they even consider actually talking to each other. The book also shows the importance of family, especially for outsider kids. It’s been awhile since I read a children’s book that kept me up past my bedtime. (I love my sleep.) You Go First is so fast paced that when I finished a short chapter, I’d think – just one more and soon I’d read THE WHOLE THING. Kudos to Harper Collins for offering this excerpt with the first 33 pages of the book. Once you or your favorite nine to twelve-year-old read it, you’ll be hooked and may find yourself begged to download the book immediately. 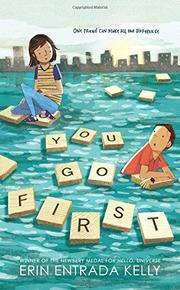 Summing it Up: You Go First is a delightful charmer filled with humor and compassion. It’s a perfect book for every kid who doesn’t exactly fit in – and that’s probably most of them. Buy this book for caring kids and teachers and parents who love them. Teachers who used Wonder in their classrooms will want to share this one. A personal note: I had the privilege of introducing Erin Entrada Kelly for her reading at the Harbor Springs Festival of the Book last year. Erin told me that her mother lives in a convent in the Philippines and even though Erin isn’t particularly religious, her mother’s influence colors her work in a variety of ways. I think readers will see that in You Go First through her compassion for her characters and in the way they treat each other. If you’d like to broaden your horizons and read more books by international authors, the next two days are the perfect time to pursue your goal. One of my favorite of all the web-based newsletters and organizations is Words Without Borders https://www.wordswithoutborders.org/ It was there that I learned about a free promotion honoring World Book Day which is tomorrow (April 23). While I’m an advocate of shopping at independent book stores, I also believe that stretching your reading choices and getting something free from Amazon isn’t a terrible idea. Reading some of the titles might even make you stop at a real brick and mortar store to look for more. The Great Alone is either going to be one of your favorite novels or it won't be your cup of tea in any way. Publishers Weekly and Kirkus Reviews loved it and gave it starred reviews. The New York Times and Washington Post panned it. I’m with the Times and the Post as I found little to like. The Great Alone features thirteen-year-old Leni who narrates the story of her life, her parents' lives, and of her love for Alaska. The tale begins in 1974 when Leni’s father Ernt, a damaged former POW, returns from Viet Nam. Ernt is unpredictable and when he loses his job, he decides to move the family to a small village off the grid in the Alaskan wilderness. Cora, Leni’s mother, will do anything to make life work for Ernt including acting as his punching bag. Despite lacking indoor plumbing, electricity, or any way to make a living, Ernt seems to improve in their first Alaska summer. Then winter comes and his moods mirror the darkness. Leni starts school and falls in love with the only other person her age in the town but Ernt detests the boy’s father and the book begins to resemble Romeo and Juliet. As Leni tells of her romance and details her father’s downward spiral, the novel seems more of a teen romance/young adult novel than adult fiction. The lack of detail and showing of the teens falling in love made it difficult for this reader to feel their relationship. Hannah presents picture-perfect descriptions of the Alaskan landscape informed by her own family history, but they aren’t enough for this reviewer to overcome the lack of nuanced characters, the melodramatic intrigue, and the hyperbolic and (for this reviewer) unbelievable plot twists. When the darkness makes Ernt’s anger worsen, Cora continues to make excuses: “It’s the weather,” Mama said, lighting a cigarette, watching him drive away. Her beautiful skin looked sallow in the headlights’ glow, almost waxen. Leni is right, it does get worse; it drifts into a nightmare for Leni and Cora. If you enjoy romance, an exotic locale, and a “happily-ever-after” ending, The Great Alone may please you as it has so many readers in the last few weeks. Washington Post critic Ron Charles wrote a wry review attacking the book’s many deficiencies but ended it by noting that he understood the book’s appeal: “By the end, I was surrounded by snow drifts of tissues damp with my tears, which may be as close as I’ll ever get to the last frontier.” That surprised me as the telegraphed ending didn’t touch me in any way. Your reaction will depend on what you want at the time. If you’re looking for a romantic escape and are willing to accept an adolescent outlook, you may love the novel. If you want more, look elsewhere. I enjoyed Hannah’s The Nightingale and it was a romance, but it was more believable and the characters had dimension. I expected more from The Great Alone. Summing it Up: The Great Alone is a book for those looking for a romantic interlude in the frontiers of Alaska. If you want a more literary, nuanced book, keep looking. Read the first chapter, then decide.